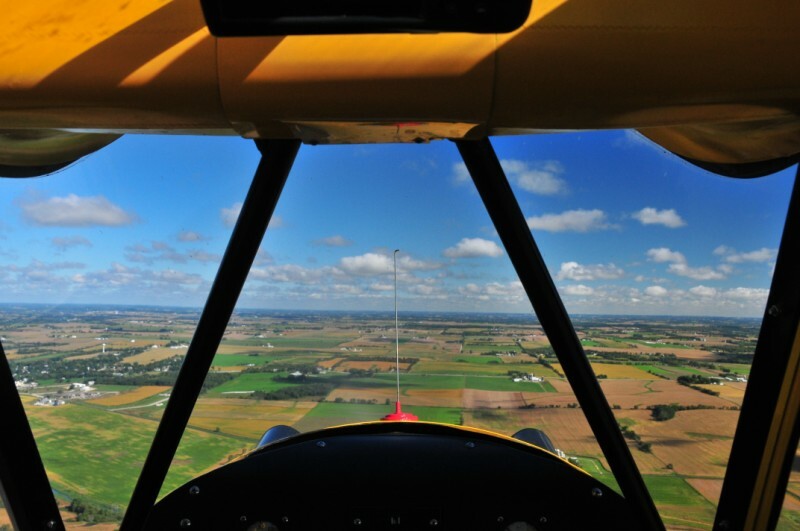 A terrific travelogue from Bern Heimos, flying throughout the U.S. in his yellow Piper Cub at an average speed of 67mph. I’ve had the impression that the Cub was a plane to be flown for fun and not necessarily to get somewhere since it is speed challenged (having flown one only once, I don’t claim to be an expert). No IFR instrumentation if you run into poor visibility. No radios. No,lights. Less is more in this aircraft with a fuel gage that is simply a wire on a cork out the front windscreen. Open the windows and doors on a summer day, and begin the take off roll down a freshly mowed grass carpet. In a few hundred feet, up you go. Climb out , cruise and landing are all about the same speed which is to say, mighty slow. And that’s just what you want too. Time to see everything. Enjoy the ride. Time to go nowhere if you want and that’s what I did, slowing the plane to near stall speed with 20 knots of wind aloft. It made it appear like I was standing still. A hat tip to my friend Lex for sharing this one. You’ll easily burn up a half hour enjoying the journey. For those interested in this type of general aviation, read Flight of Passage which follows the adventures of two teenage boys who rebuilt a Piper Cub and flew it from New Jersey to California, becoming the youngest avaiators to fly coast to coast in 1966. This entry was posted in Antique Planes, General Aviation. Bookmark the permalink. Sent you an e-mail with that vid info last week. Did it end up in your spam as before? Get back to me if I need re-transmit.